Benjamin Leigh-Smith, or « Ben » as he liked to be called was 34 years older than his wife, my grandmother, Charlotte (Sellers). She told me stories about his life that I remember to this day ! He was a wealthy but modest man, although not averse to the admiration of the Ladies on the dance floor. She also told me how he had always kept the key to their house in his waistcoat pocket. Getting home in the early morning, after being presumed lost for many months, he let himself in quietly so as not to disturb anyone. 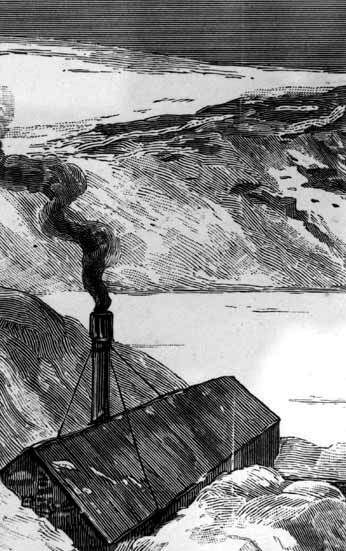 He was not only an explorer, but also a man with a first class scientific mind who in 1872 foresaw the dangers of global warming. I am his grandson, Christopher. Ben was an explorer who made many voyages to the North Pole. His father, William Smith, fought the slave trade with William Wilberforce.. Benjamin helped his family fight for the rights of women, built schools, universities, homes for the poor and much else.. His full name was Benjamin Leigh-Smith or simply «Ben Smith » as he liked to be called. He led 5 expedtions to the Artic and lost his ship, the Eira, during one of them. He and his men survived 6 months darkness of the bitter North Polar winter before heading back in four rowing boats with sails made from table cloths in gale force seas..
Ben was born on the 12th March 1828. Before becoming an arctic explorer, he was a barrister in London specializing in the defence of women’s rights. 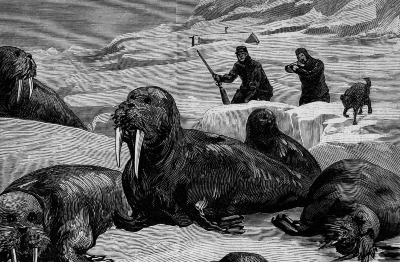 He was, however, irresistibly drawn to polar exploration. The picture is one of the EIRA. Having gained experience from his three previous expeditions, Ben decides that what he needs is a ship especially built for the ice. 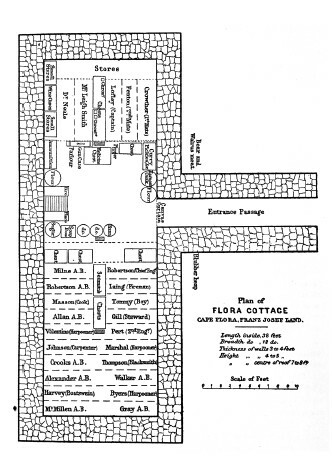 At his own expense he commissions the yard of Stephen and Forbes in Peterhead. 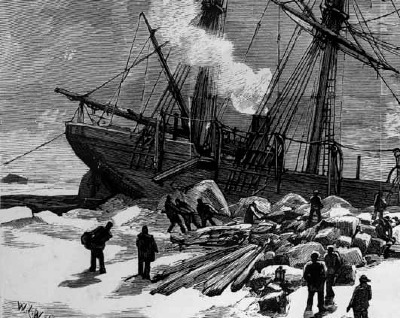 Their job to build a wooden hulled ice-breaker.This results is the EIRA. She is a 240 ton screw barquentine equipped with a 50 horse power engine and an overall length of 129.6 ft..This ship meets his requirements and together with his crew they sail in her in 1880 to the discovery of new territories and routes through the arctic. He makes five voyages in an attempt to reach the North Pole. 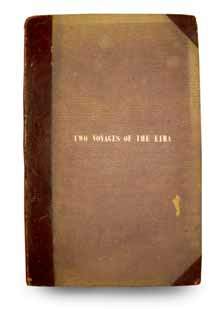 In 1871 and 1872 he explores virgin regions North of Spitzberg. At a shallow depth of 457 meters in very deep waters he discovers a current having a high temperature of 0.6° C., and corroborates his theory that there was a means of forgeing a passage across the Arctic through the Barents sea as well as his fears over global warming.. 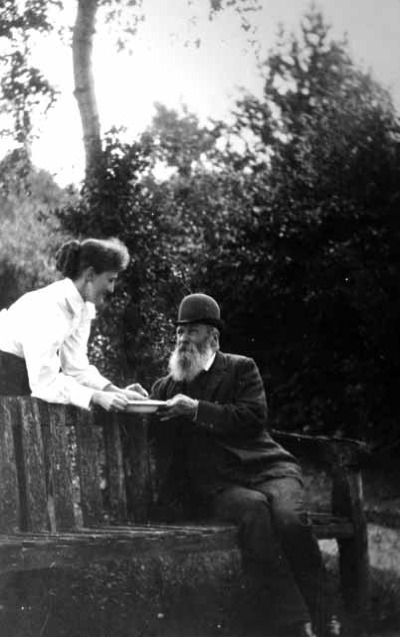 In 1873 on a new expedition with the DIANA he brings supplies to Professor A.E. Nordenskiold in the North. Benjamin's maritime and overland discoveries as well as his observations on the local flora, sauna and minerals were universally acclaimed by the World’s leading scientists and brought him many decorations for his work. 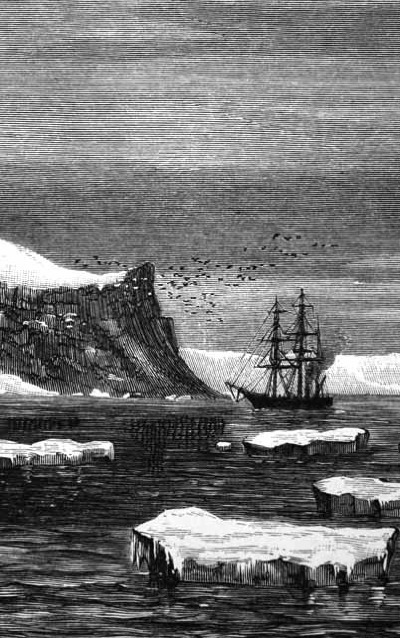 By way of Royal recognition Cape Leigh-Smith was named after him as well as much of Spitzbergen and Franz-Joseph Land after his family and crew. Nightingale Sound after his niece Florence, the Lady of the Lamp. She accomplished more than anyone for nursing and hospitals. 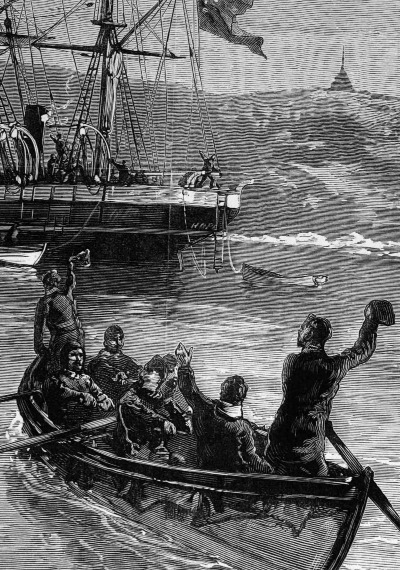 On board the EIRA in 1880 by courtesy of Arthur Credland Hull Museums. On July 11th 1880 the Eira is on her way to the Arctic when she meets up with two other Peterhead ships, the Hope and the Eclipse. 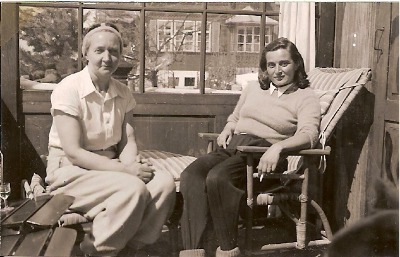 The meeting is recorded in this historic photograph taken on the aft deck of the Eira. 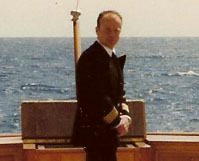 From left to right are: David Gray at the helm (Capt. Eclipse), Benjamin Leigh-Smith (Capt./owner Eira), Arthur Conan Doyle (Surgeon Hope), John Gray (Capt. 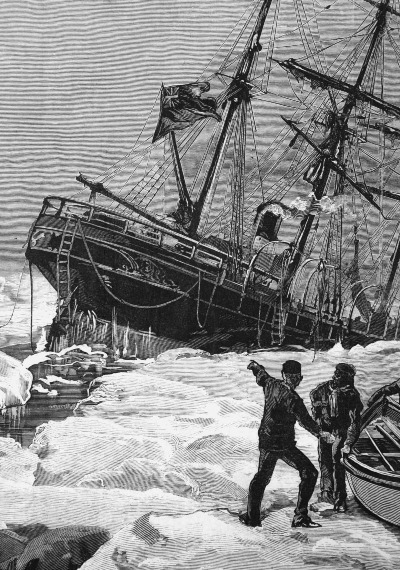 Hope), Dr.Walker and Dr.Neale, and William Lofley (ice master Eira) right at the stern. Conan Doyle was then an undergraduate at Edingburgh University and his Arctic experiences on board the Hope lead to his taking up the pen as the spiritual father of Sherlock Holmes and publishing "The captain of the Polestar" in 1883. 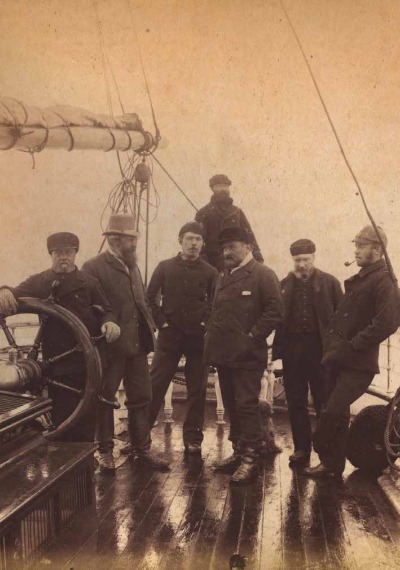 On the 14th of June 1881 Ben again sails with the Eira and 25 crew, a cat, a canary and Bob the dog who was to prove invaluable to the expedition. His goal: the discovery of new territories North of those discovered in 1880, as well as a study of the deep sea currents and their influence and more specifically the Gulf Stream. 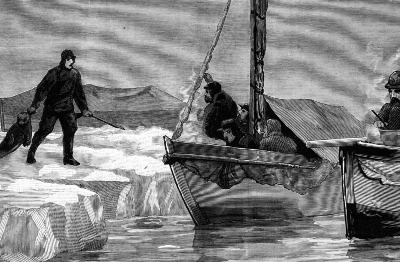 On the 21st of August 1881, on a magnificent sunny day their ship is crushed between two icebergs off Cape Flora in Franz-Joseph land. Luckily the crew are able to salvage some of the stores and equipment before the EIRA goes down. 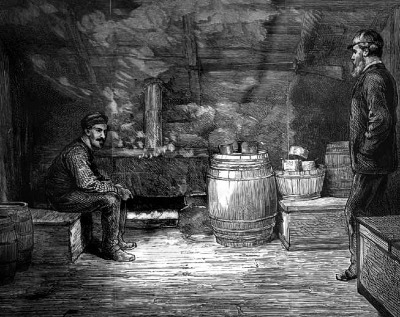 The men knew they would be prisoners of the ice for many months. She sinks in a few hours. The crew strive to save a maximum of stores and equipment in an attempt to survive the dreadful polar winter they know they will now be facing. The EIRA sinks in two hours. After the EIRA went down the men set to building a shelter that was almost immediately wrecked by the gale force rain and winds. 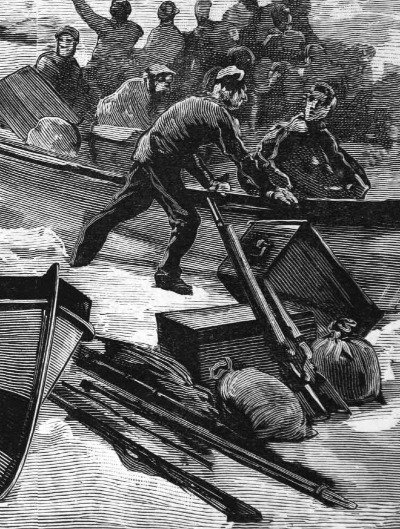 On the 23rd August despite their utter exhaustion they manage to recover debris from the ship that float up to the surface and are blown onto the shore nearby. They also built other huts to store the fish and meat they would need to kill and presereve. Bob the dog was invaluable in this and without his unremitting courage none of it would have been possible. 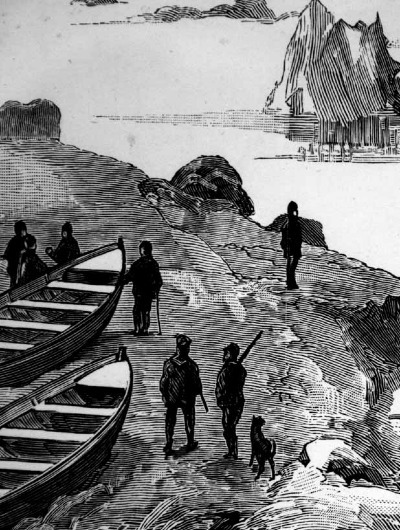 On several occasions during fishing and hunting expeditions one or even several men would fall into the icy waters. Bob the dog always managed to save them, sometimes even running back to the camp for help. 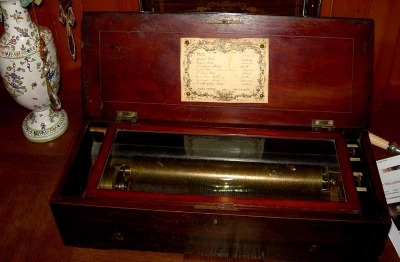 This musical box, now safe in Christopher’s home, was the only entertainment during the six months of darkness. And then it was light again. Time to go hunting for food with Bob the dog, for the journey back. 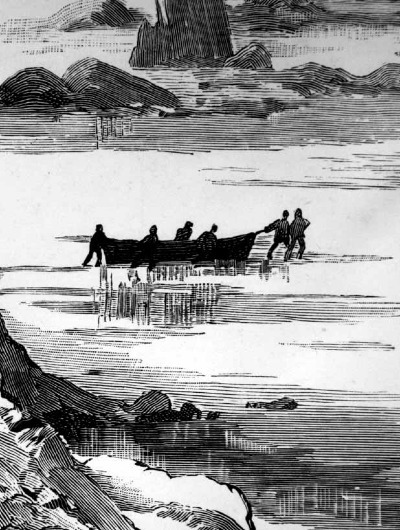 They were going to have to row and sail in those small boats using sails made from table cloths saved from the Eira as best they could from close to the North Pole back through ice flows and the raging Barents seas. Hauling a life-boat over land, ice and water. 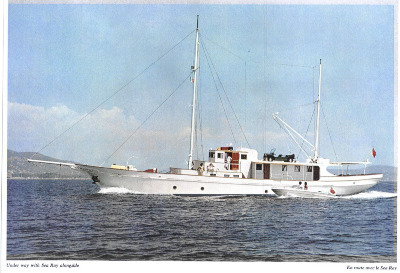 The Hope and one of the 4 of the Eira's life-boats that the crew spent 3 weeks in on their journey from Cape flora where the Eira went down to the shores of Nova Zemlya where they met with the 3 ships sent to rescue them. During 3 weeks of terrible storms in their open boats they are in constant danger of capsizing. Despite it being late Spring the bitter cold freezes their clothing as well as their food reserves. 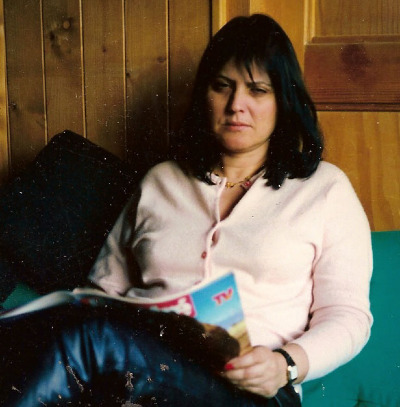 Totally exhausted they are not far from Matyushin shar, on the Eastern coast of Nova Zemlya, when they are saved by the three ships, that had set out to rescue them. The ships are: the Hope skippered by Sir Allen Young , the little Kara was also there with Sir H. Gore Booth and Mr. Grant and the Dutch exploration vessel, Willem Barents with Captain Hoffman. Home at Scalands – Robertsbridge-Sussex. Ben is a little aged, and his wife Charlotte is as beautiful as ever. Thanks to Ben’s military-like discipline all his men survived the winter. Despite the loss of the EIRA the result of the expedition was positive. Ben’s choice of setting up a base for future expeditions at Spitzbergen is widely approved and his discoveries and courage are acclaimed by the Royal Geographical Society. His legendary discretion nevertheless prevents the full recognition of the importance of his discoveries until quite recently. Fortunately he made the results of his work available to various research institutions including the Royal Geographic Society and they are proving invaluable to present day research on Global warming. William Smith (Ben's grand father b 1756 d 1835) the abolition of slavery with William Wilberforce. Women's rights. Benjamin Smith. 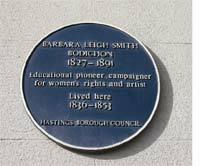 Later Leigh-Smith, (Ben's father b 1793 d 1861) Access to education for the poor. 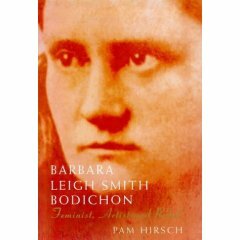 Barbara Leigh-Smith Bodichon. (Ben's sister) Education, rights for women, the right to vote, the right to manage and own their property, Schools for the poor at Scalands. The creation of the first womens news paper. A well known painter. Married Dr.Bodichon. A plaque commemorating a house Barbara lived in by the HASTINGS BOROUGH COUNCIL. 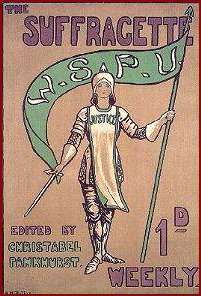 Barbara was the co creator of the Suffragette movement. Florence Nightingale (Ben's niece): The Lady with the Lamp. 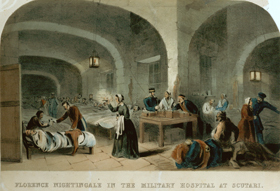 The reform of surgical, medical and nursing proceedures during the Crimean war (1854-1856) and after. The creation of homes for unmarried mothers, nursing homes, a military hospital and much else. Ben had two sons. 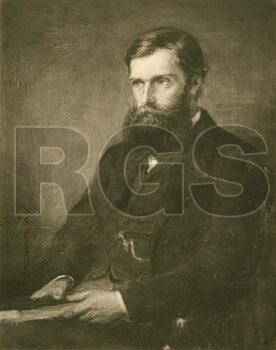 The eldest, Benjamin Valentine Leigh-Smith (below) served in the Royal Navy and created the "False Note" code system. He was also a composer and musician of great talent. 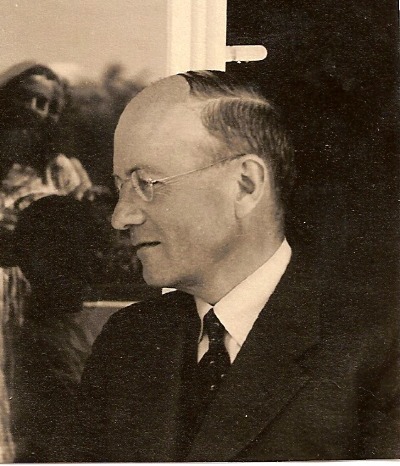 The youngest was Philip Leigh-Smith (below), Intelligence during the 1914-18 war, author and diplomat. 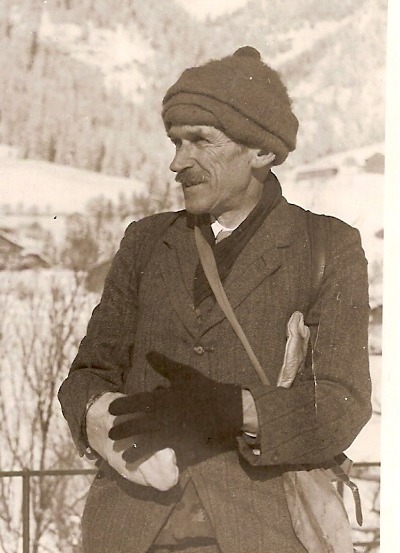 He took part in several British Relief Missions to Russia during the Bolshevik revolution and spoke Russian fluently as well as French and German. He was also a successful author under the pen name Christopher Rover. Two of his novels, Pandemonium and the Red Horse were set in the Russia of the time and won him great acclaim. In 1933 he married Alice Prebil from Karlovac. He was a British Diplomat who served in capitals including Rome and Bern where he was Chargé d'Affaires. He also wrote a brilliant comedy entitled "Ladies in Diplomacy" which may or may not be based on the true adventures of his wife. To the right is Philip's wife Dr.Alice Leigh-Smith Phd physics, discovered element 85, worked with Irene Joliot Curie in Paris, left of picture and below. 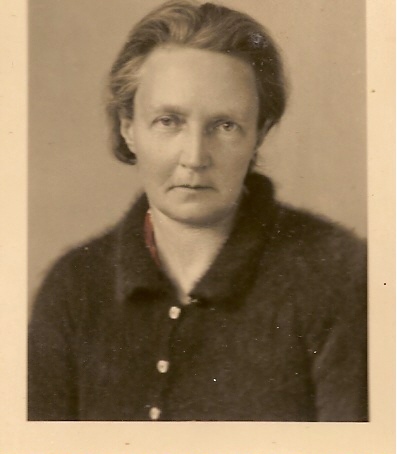 Alice also worked in the Radium Institute in Bern, the Istituto Superiore di Sanita in Rome with Professor Marotta and was awarded the Order of Merit in Chili for her work there. 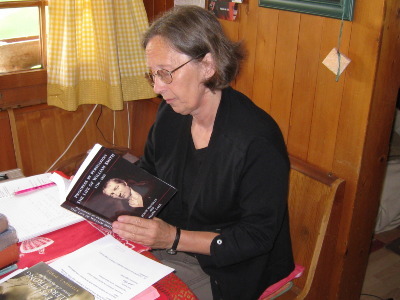 Jenny Handley reading a copy of her book on the life of William Smith, the grand father of the explorer Benjamin Leigh-Smith. Ben's grandson, Alice and Philips' son, Christopher Leigh-Smith in uniform. Today he is an entrepreneur in Chateau d'Oex, Switzerland who is committed to promoting meat alternatives and contributing to actions against global warming and the related slaughter of animals. 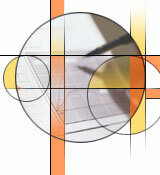 Our organization is interested in hearing from like minded people. .Below the MY CONTESSA D'AZUR with Minimoke on boat deck & Sea Ray alongside. Christopher's yacht and HQ for many years. All rights protected by the Bern convention.